michigan | Where is @rusnivek? 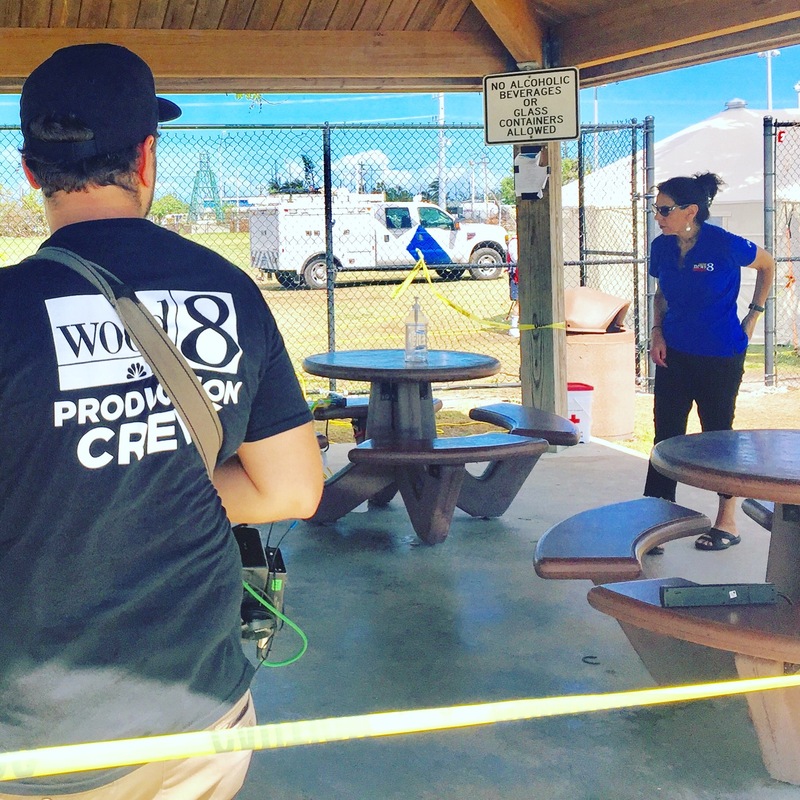 It’s great to share the stories of survivors and employees here at FL / FEMA Disaster Recovery Center in Marathon. Glad to host WOODTV news crews from Michigan today. December was relatively busy but say hello to January 2017! In the first week, its paperwork mania! As usual, we have yearly update classes that needs to be completed and mandatory inservice training. Second week, I’ll be headed to the State of New Mexico’s Department of Heath to teach Social media. For my friends in Region-6, I also need to figure out if I’m a green or red. Hmmm. Third week, I’ll be presenting at the huge PIO Conference in Franklin County (Columbus), Ohio. Working the PIO magic with Jennifer Ciaccia and Erica Creech. It’s a huge conference with tons of participants. Do you want to attend? Just email Xenia (xeniapalus@franklincountyohio.gov ) for more deets. Fourth week, I head back to St. Clair County Michigan to teach social media. If you remember, these are my peeps who participated in the big Cause IV experiment with the Department of Homeland Security Federal Emergency Management Agency, and Canada’s Public Safety on a cross-border full scale exercise in 2016. Excited to see my peeps again! 2017 is here. Bring it! Bright and early, we kicked off the second day of the 2016 ASFPM Conference here! Class looks ready – because there is FREE coffee provided!!!!! Of course, I’m already – thumbs up for social media! Also having a solid co-instructor is +1! And what social media class doesn’t include a few redic and hilarious Snaps?!?!?!? Snapping…cause all the cool kids are doing it. Lots of new social media friends in Michigan. Many mahalos to the outstanding hosts from the Michigan State University Police Department and the use of their Emergency Operations Center for our #NDPTC class. Our class included a social media inject from FEMA Administrator Craig Fugate. Lots of discussion on data mining, geolocation, and information gathering including a little real-time people uses and their platforms. How was your coffee Valerie? After class was over, many of the participants (Cooper and Valerie) said to check out the famous MSU Dairy Store. Maybe next time I instruct in Lansing. 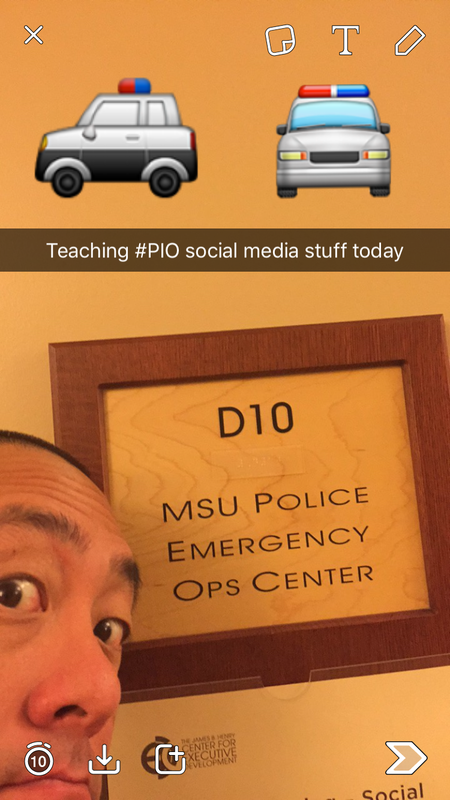 Social Media NDPTC course today at the Michigan State University. Lots of agencies from all over Michigan. Great to see such engaged peeps and representatives from our all-hazards partners in public safety. April 2016 was solid, but it’s gonna be May…..
Instructors Kevin Sur and Justin Timberlake. Heh. First week, I will be instructing FEMA’s National Emergency Management Executive Academy Program at EMI specifically on Crisis Communications, Public Information Officer, and Social Media. Then heading back to Ohio to teach a basic Public Information Officer’s Course and Joint Information Center/System course (G-290/291) in Summit County. R3 and R5 = Twofer in just the first week! Second week, I will head back north to Michigan to teach social media at Michigan State University. Then the last half of the week spent in Chicago for meetings with various public safety officials including Chicago Fire. Third week, we have a State of Ohio Emergency Management Instructors’ Workshop at Ohio EMA in Columbus. Good chance to chat and share successes with our staff – who are all good stewards of Emergency Management. Cbus baby! Fourth week, I will be instructing in the big DHS/FEMA 2016 National Training and Exercise Symposium at EMI. Whohoo!!! Hoping to catch up to Brian Kamoie and Doc Lumpkins again. Then jetting off to Nebraska to teach Social Media and Crisis Communications in the statewide CPESymposia. R3 and R7 in the hizzouse! Yep, it’s a 3-5-7 kinda month – A big month indeed.